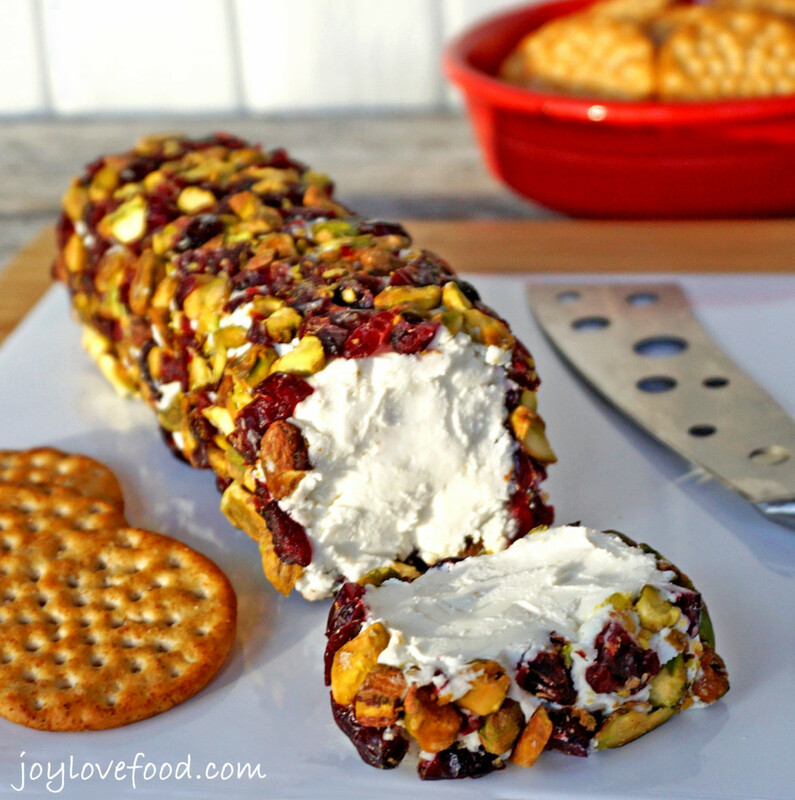 Simple, easy, festive and fun, Goat Cheese with Pistachios & Cranberries is the perfect appetizer or snack for your next holiday gathering. Creamy goat cheese, crunchy and salty pistachios and sweet and tart cranberries come together beautifully in this pretty Goat Cheese with Pistachios & Cranberries. The red, white and green colors make it perfect for the holidays, or anytime you need a quick, yet festive and delicious appetizer, hors d’oeuvre or snack. 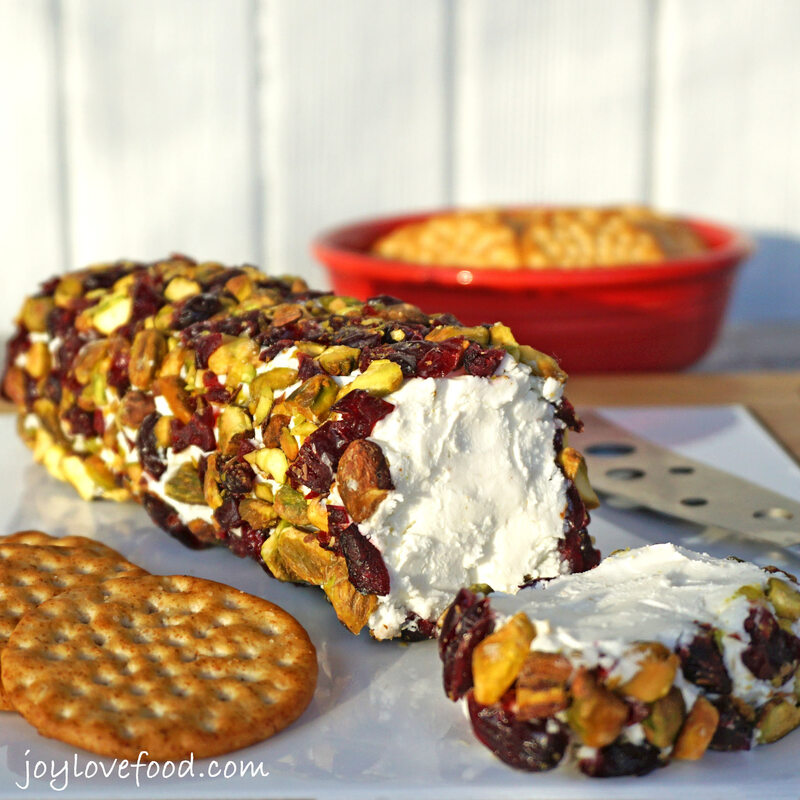 I came across this Goat Cheese with Pistachios & Cranberries at Real Simple, and knew I had to make it. Goat cheese is one of my favorite cheeses and I love pistachios. Luckily, some of my neighbors were having a wine and cheese party this past weekend and I had the perfect excuse to make it. It was so easy to put together and is such a delicious combination of flavors. 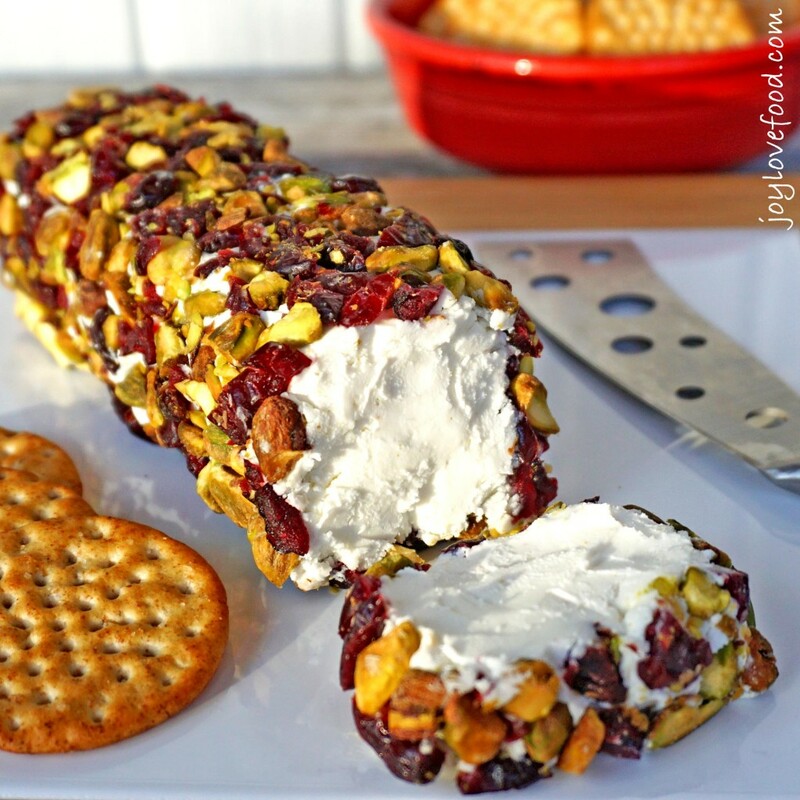 Goat Cheese with Pistachios & Cranberries is a great appetizer for a cocktail or dinner party. It would also look beautiful on a buffet for a holiday open house or potluck. This pretty Goat Cheese with Pistachios & Cranberries is also a wonderful snack for a lazy Sunday afternoon curled up with family and friends by the fireplace. 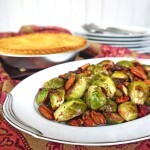 On a large plate or cutting board, combine chopped pistachios and dried cranberries. Roll the goat cheese log in the pistachio cranberry mixture, gently pressing mixture into cheese, until all sides are coated. Serve immediately with crackers for spreading. Or, wrap goat cheese log in saran wrap and refrigerate until ready to serve. 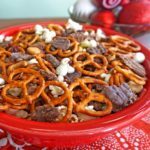 This entry was posted in Appetizers & Small Bites, Dips & Spreads and tagged appetizer, cranberries, entertaining, goat cheese, holidays, pistashcios, recipe, spread. 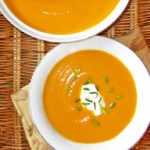 Hi Joanne, I’m so glad to hear you made this recipe and that it was a hit! Happy Holidays! The colors in this are absolutely beautiful! Sounds like a yummy recipe. Can’t wait to try this Joy. Joy -this looks incredibly delicious! I pinned this for my next party. I love your cheese knife too. Thanks so much! Thanks for the pin, hope you give it a try and enjoy! Thanks so much and thanks for the pin 🙂 Merry Christmas! Thank you for joining us on #PureBlogLove Link party for recipes and DIY crafts! I love reading about your adventures in cooking and look forward to seeing you again this week at 8 pm EST Thursday -Sunday night midnight to celebrate yet another fun week ! Thanks Heidy! I will definitely be back at your party! Thanks Julie! Thanks for coming by! Sounds so interesting with Goat Cheese, I love cheese and have done similar ones but never tried it with goat cheese, this is one that I will definitely be making very soon. Thanks Amanda! I agree, it is such a wonderful combination, hope you give it a try and enjoy! Thanks Merlinda! Thanks for coming by! This does look very festive! 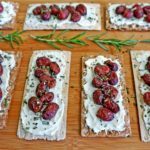 I love goat cheese to begin with, and the idea of pairing it with dried fruit sounds wonderful. Thank you for sharing with See Ya in the Gumbo this week! Thanks Robyn! Hope you give it a try and enjoy! This log is an incredibly clever idea for taking the red and green theme onto the table without artificial ingredients! Plus the nuts, cranberries and goat cheese go so well together. Thanks for stopping by our Happy Holidays Link Party – be sure to join us again this week, beginning on Saturday at 7 pm ET. Thanks Laura! I will definitely be back at your Happy Holidays Link Party! Thanks so much Nicky! I’m thrilled to be featured again at Let’s Get Real!! This looks fabulous! I think I have everything I need to make it too! Can’t wait to try it! 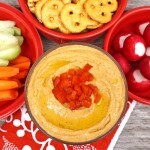 Thank you so much for sharing it with us at Foodie Fridays…I am pinning and stumbling this yummy appetizer! Thanks so much Michelle! I’m thrilled to be featured at Foodie Fridays!! Thanks Christie! Thanks for the pin! I know goat cheese is hit or miss with some people, but I for one, love it. This flavor combo is making me hungry (time for a second breakfast perhaps). Thanks Christine, I’m with you, I LOVE goat cheese, thanks for coming by! This is a great combination of flavor and colors. Thanks Thao, thanks for coming by! Oh wow, does that look delicious!! Perfect for my New Year’s Day party!! Thanks for sharing it! Thanks AnnMarie, hope you give it a try and enjoy! Wow! Love this combination. Looks divine! I have the goat cheese and cranberries. I will have to check the pantry to see if we have any of our home grown pistachios left. Best of Thanksgivings! Thanks for coming by to see us at BeBetsy. Hi Denise, hope you give it a try and enjoy!